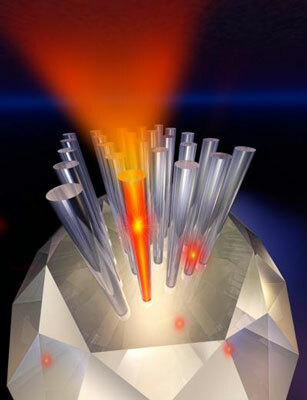 Diamond nanowires emit single photons, providing new options for high-speed computing, advanced imaging and secure communication. Researchers detail a method that uses hydrogels - less than 100 nanometers in size - to sneak a particular type of small interfering RNA (siRNA) into cancer cells. Once in the cell the siRNA turns on the programmed cell death the body uses to kill mutated cells and help traditional chemotherapy do it's job. Scientists at the Georgia Institute of Technology have shown that by directing gold nanoparticles into the nuclei of cancer cells, they can not only prevent them from multiplying, but can kill them where they lurk. Welding uses heat to join pieces of metal in everything from circuits to skyscrapers. 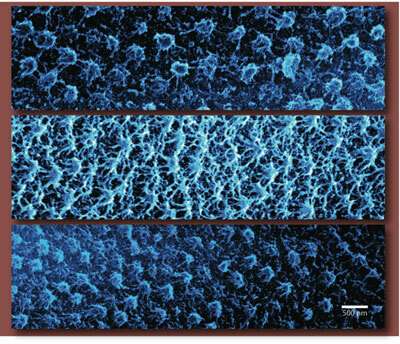 But Rice University researchers have found a way to beat the heat on the nanoscale. 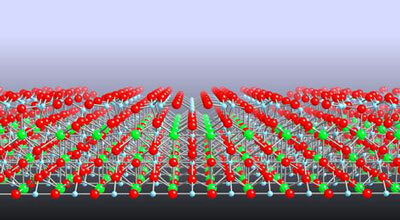 An international team, including Oxford University scientists, has been investigating what happens to the top layer of atoms on the surface of a material. RUSNANO CEO Anatoly Chubais and head of the Russian Federal Medical-Biological Agency Vladimir Uiba signed an agreement today to work jointly to ensure safe production and safe application of nanotechnology and nanomaterials. Sensitiv, selektiv, raeumlich und zeitlich aufgeloest: ATP-Detektion in lebenden Zellen mit Kohlenstoffnanoroehrchen und Luciferase. A conference which will discuss emerging silicon-based nanotechnologies for advanced information AND communication devices which mean that mobile phones and computers will be even lighter, more functional and more economical, will be held at the University of Southampton next month. Two new appointments at the University of Southampton's Nano Research Group will drive research into a whole new range of nano and bio-nano technologies and lead to global industrial research collaborations. 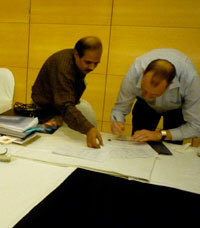 SabryCorp, Ltd. announced the upcoming NanoAgri Conference, scheduled for April 11-12, 2010 in Cairo, Egypt. It will host the leading experts in this field to discuss the revolutionary solutions nanotechnology offers the agricultural and food industries. Toshiba Corporation and the National Institute of Advanced Industrial Science and Technology (AIST) today announced joint development of a mask pattern optimizing technology that improves the accuracy of lithography for LSIs by approximately 20%. Challenges in developing cost-effective, efficient and stable solar energy systems are being tackled by two government-led solar research projects. By creating diamond-based nanowire devices, a team at Harvard has taken another step towards making applications based on quantum science and technology possible. 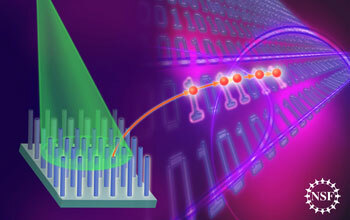 By manipulating a mysterious quantum property of light known as entanglement, researchers are able to mount up to two photons on top of one another to construct a variety of quantum states of light - that is, build two-story quantum toy houses of any style and architecture. 2011 is the International Year of Chemistry! To celebrate Leonardo is seeking to publish papers and artworks on the intersections of chemistry, nanotechnology and art for their on-going special section on nanotechnology and the arts. This book provides a very detailed and interesting overview of the fundamental principles of nanoscience, discusses the background of several nanoscience experimental techniques, and sheds light on some of the visionary and important applications in the truly interdisciplinary area of nanotechnology.